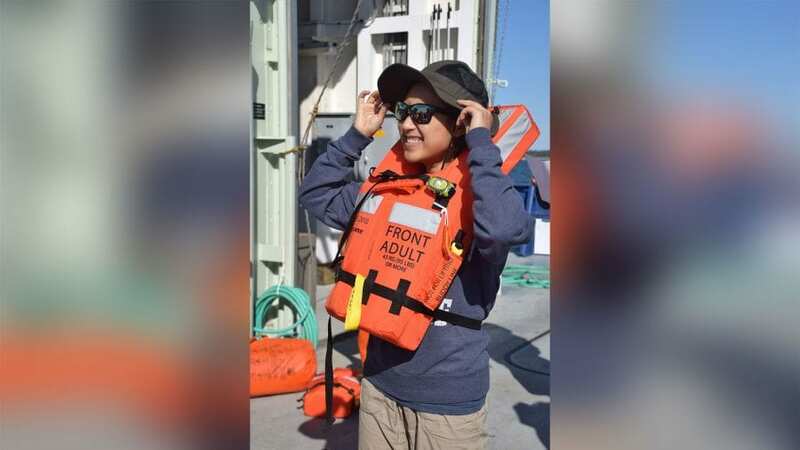 Emmanuel Codillo and Jing He are graduate students at Woods Hole Oceanographic Institution (WHOI), which is renowned for its ocean-going research. 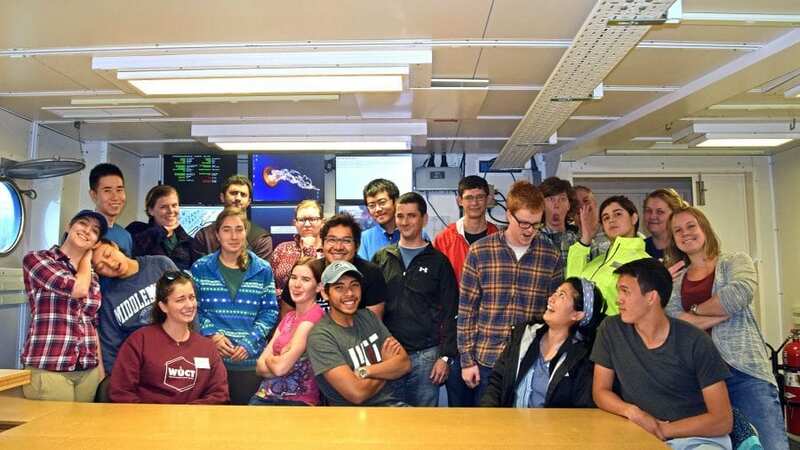 But like many incoming students, Codillo and He had never set foot on a large research ship until last September, when they joined 14 other first- and second-year students on a 30-hour cruise to the edge of New England’s continental shelf aboard the research vessel Neil Armstrong. “When I first stepped into it, I was kind of amazed,” Codillo said. Every year, students in the MIT-WHOI Joint Program take a Student Orientation Cruise designed to introduce new graduate students to shipboard life and the basic techniques and equipment involved in oceanographic research. Previous orientation cruises have been aboard the Sea Education Association’s 98-foot-long sailing ship, the SSV Corwith Cramer. 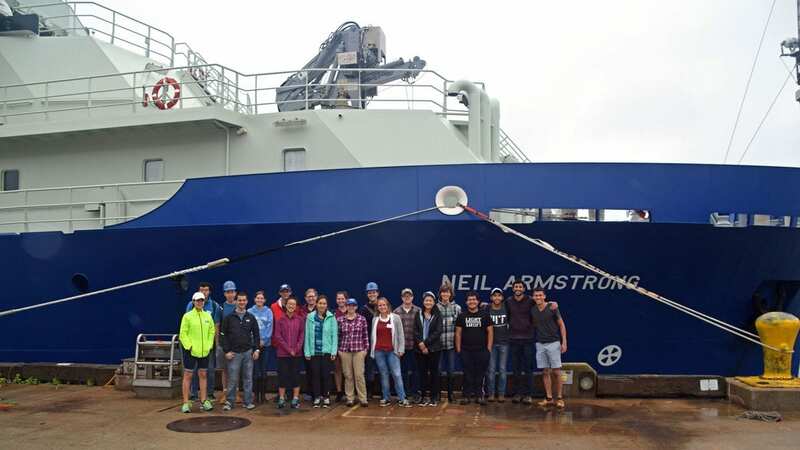 But in 2017, WHOI Vice President for Marine Operations and Facilities Rob Munier had the idea of taking students out on the Armstrong. 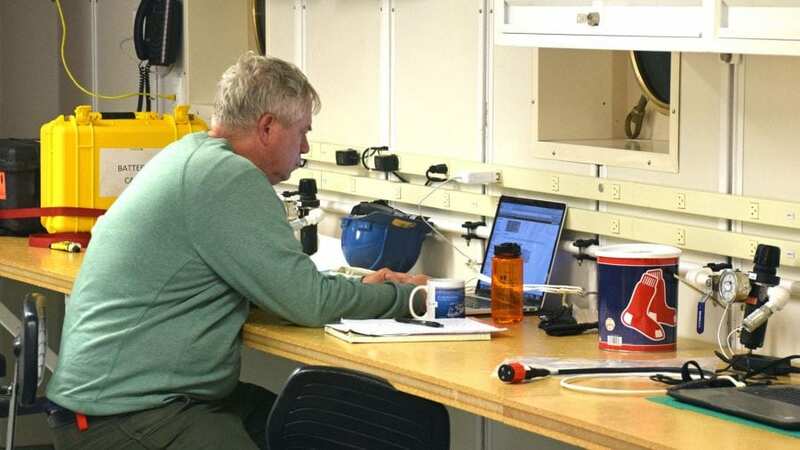 Taking on that “amazing pile of work” were Jacob Forsyth and Joleen Heiderich, both physical oceanographers; Kevin Archibald, a biologist; and EeShan Bhatt, who works with acoustics—all third-year graduate students. There were forms to be collected, certifications to verify, safety gear to check out, and berths to assign—“and, of course, there’s the whole actual planning of what science you’re going to do,” he said. The plan was for the Armstrong to travel along a transect from Cape Cod, Mass., to the Ocean Observatories Initiative’s Pioneer Array, an installation of moorings and underwater gliders collecting oceanographic data at the edge of the continental shelf, about 80 miles south of Martha’s Vineyard. 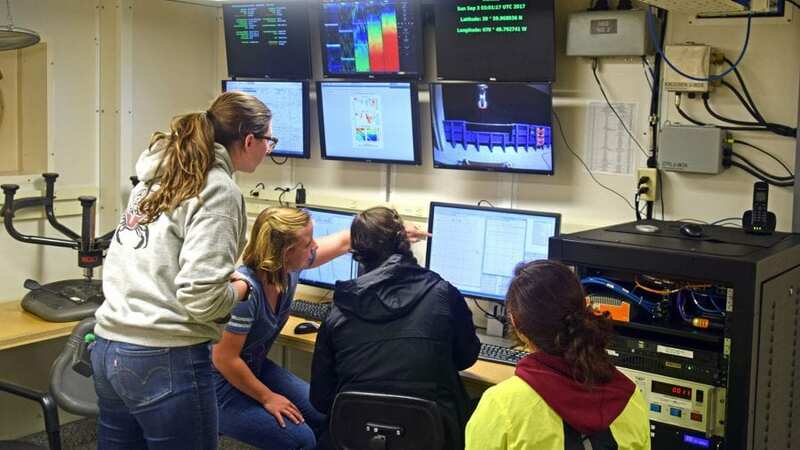 Along the way, the ship would stop at a dozen sampling locations, or stations, where students would use an instrument called a CTD rosette to measure temperature and salinity of seawater in real time. Forsyth and Heiderich also planned to have the students use the ship’s Acoustic Doppler Current Profiler, or ADCP, to measure water velocity; its multibeam sonar to map the topography of the ocean bottom; and its EK80—a multifrequency echosounder—to look for a diversity of organisms beneath the ship. For some students, the cruise was also a chance to try out equipment outside of their usual field. 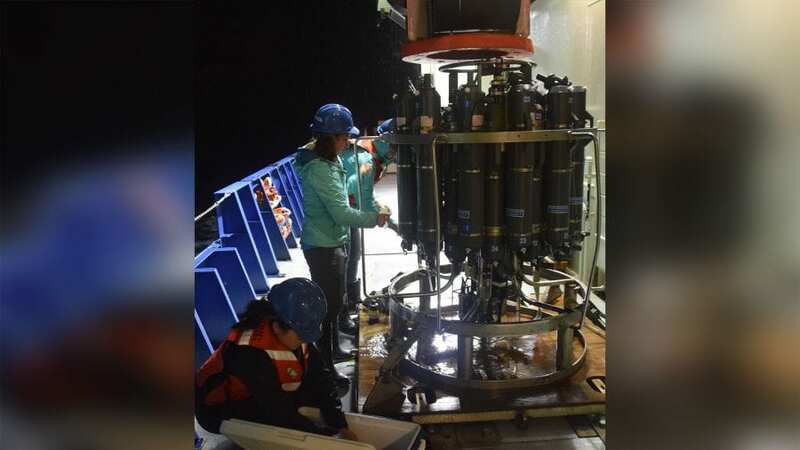 Both Codillo, who is studying marine geology, and He, who is studying physical oceanography and climate, ended up working in the ship’s lab with an Imaging FlowCytobot, an instrument invented by WHOI biologist Heidi Sosik to take high-resolution images of the ocean’s microscopic life. Doing science at sea takes careful coordination between the scientists and the ship’s captain and crew, starting well before a cruise begins. In this case, it was up to Forsyth and Heiderich to work out all the details: to verify the speed of the ship, how long it would take to get to sampling locations, and how much time would be available at each location, for example. That was especially true on this particular cruise, Gawarkiewicz said, because so many of the students had not been on a research ship before. On a typical cruise, there might be at most one or two people who have limited experience at sea. Having the cruise be both educational and safe was a top priority. 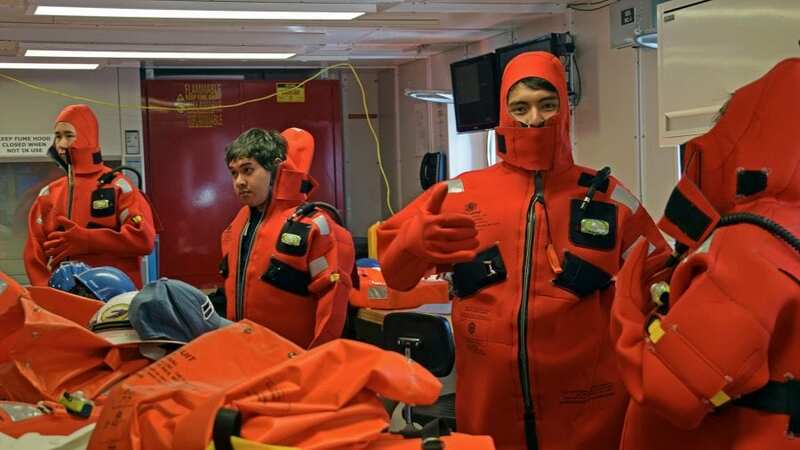 For the first-year students, it was a chance get to know the Armstrong crew, to meet their peers in other marine science fields—and to get a taste, literally and figuratively, of shipboard life. But not everything about the cruise happened on schedule, or according to plan. When it comes to doing research at sea, you have to be adaptable—and expect the unexpected. For one thing, the weather out on the open ocean is always a wild card. “When we first set out it was really nice, and sunny, and seashells, and balloons,” Gawarkiewicz said. But by midnight, everything looked and felt very different. To complicate matters, a trawl winch malfunctioned, making it impossible for the night shift to do the net tows that Forsyth and Heiderich had planned—so they had to do some quick thinking. “Things go wrong, and you have to be ready to adapt to that,” echoed Forsyth. Codillo says he was couldn’t believe how well Heiderich and Forsyth handled everything. Munier and Gawarkiewicz count the 2017 cruise as a big success. But they say 30 hours was not enough time for the students to really get a feel for the pace and momentum of a research cruise. They have already begun planning for the next one—a three-day expedition this November.